Release Date: October 27, 2006 Distributor: Nu-Lite Entertainment. Synopsis: This movie examines the final 48 hours of Jesus Christs life before his capture at Mount Gethsemane. By portraying Jesus as a black man, this movie may appear controversial to some. However, it stands to be the single most positive image of a black lead character in a film to date. The controversy lies in the portrayal of Jesus as a black Nazarene, persecuted because of his radical interpretation of the Torah. 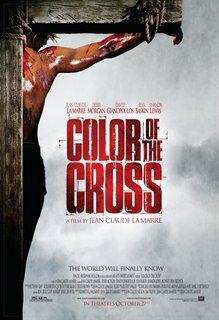 Color of the Cross tells a story that is familiar to most. However, since Jesus is portrayed as a black man, this version of the story of Jesus can examine the role that race may have played in the persecution, capture, and crucifixion of Jesus.